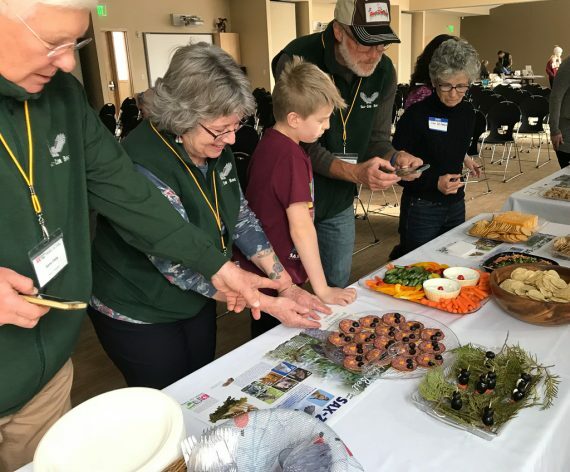 We managed to wedge the 2019 Boreal Wings Gala in-between bitter cold (Minus 32 when we left Duluth in early a.m.) and heavy snow (snow in Mpls held off until after the event), and over 100 of our loyal “Bog Buddies” attended! 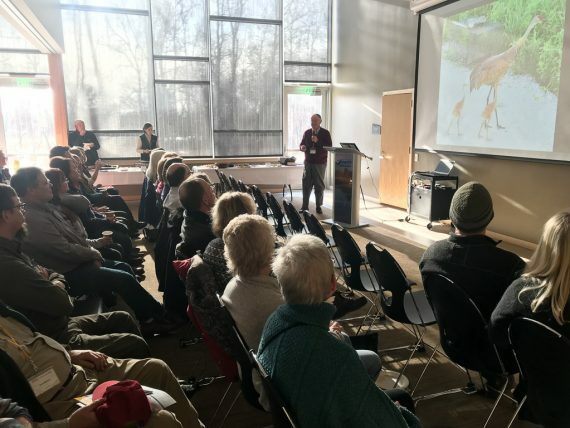 Our keynote speaker, Dr. George Archibald, founder and Director of the International Crane Foundation delighted the crowd with a fascinating talk on the worldwide status of all 15 crane species. He gave special attention to the Sandhill Crane which is thriving in Sax-Zim and all over its breeding range. With George’s breadth of knowledge on this topic, he could have spoke for six hours straight…and we all would have been wrapt. 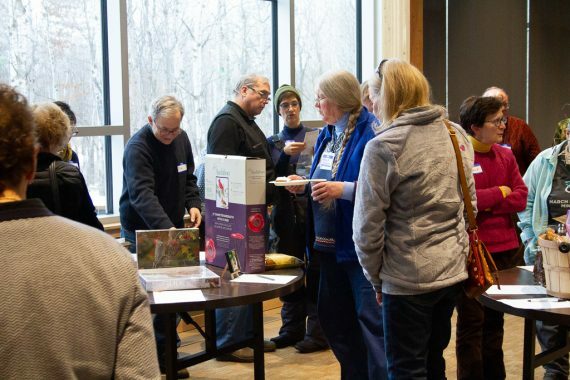 Sparky updated the attendees on upcoming Friends of Sax-Zim Bog projects including our goal of 25,000 acres protected by 2020. More details coming soon! 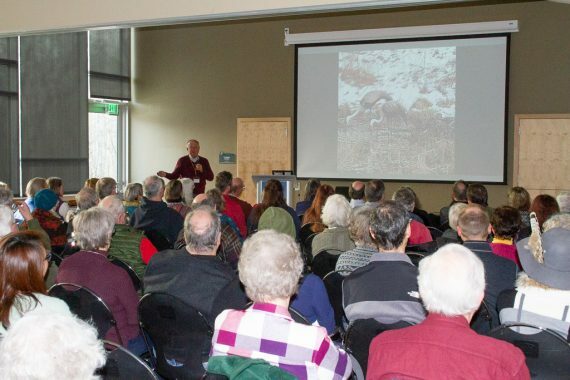 The World Premiere of a new Clinton’s Critters on how Great Gray Owls hunt was a big hit. It is on YouTube now and soon on our website. 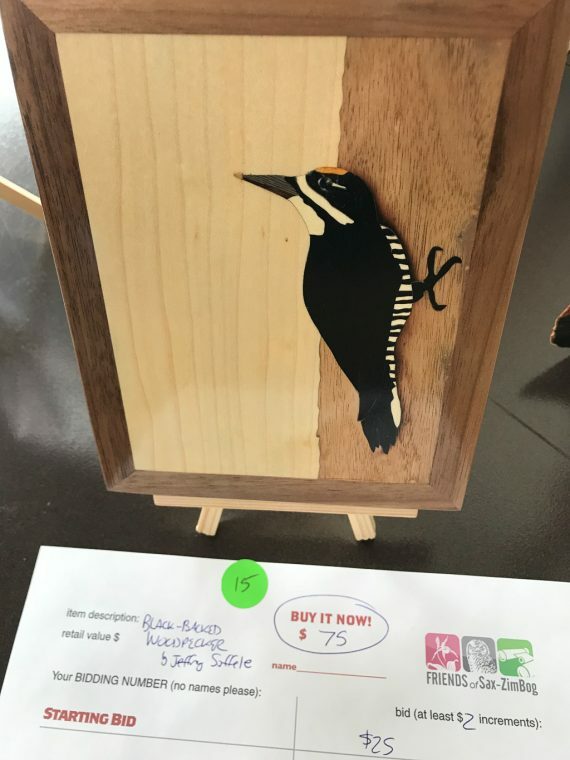 The Tiny Bird Art Silent Auction included many fascinating pieces of art…All original pieces of art! Our Board chair Lori also put together four baskets with the themes: Air, Fire, Earth & Water. Folk art bird ceramics by 90—year old Duluthian Ray Naddy also went for big bucks. Sparky and Clinton donated half day field trips. Thanks to all who donated pieces this year. What a creative bunch! 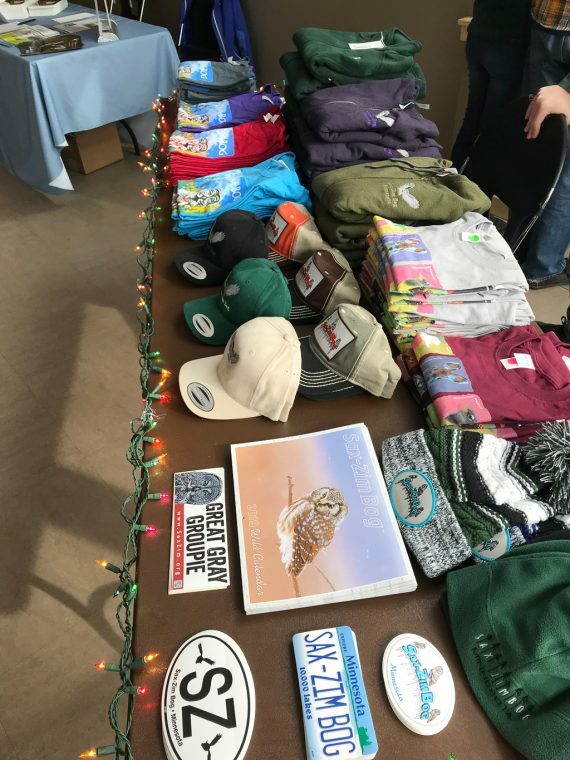 The auction alone raised over $3,500! We also had a donor come forward to purchase an acre of Fermoy Bog (Thank you Lois & Richard King! ), and a couple is very interested in supporting our next owl tracking research projects. All told we raised over $7,300 with commitments of thousands more. Thank you all! In between speaker folks got to sample some creative bird-themed appetizers, catch up with old friends and make some new ones. Lots of chatter and laughter going on! 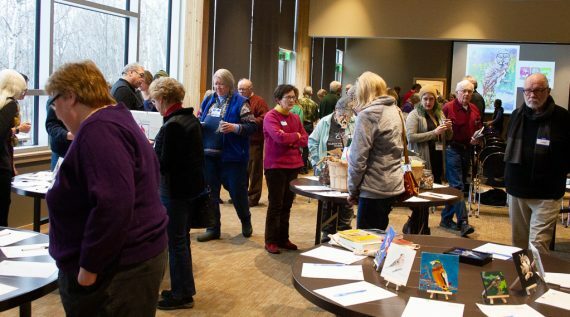 Hope you can join us in January 2020! 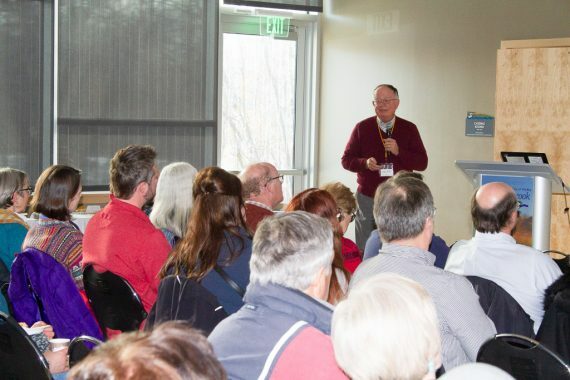 George Archibald, founder and Executive Director of International Crane Foundation speaks about the worldwide diversity of cranes to more than 100 attendees. 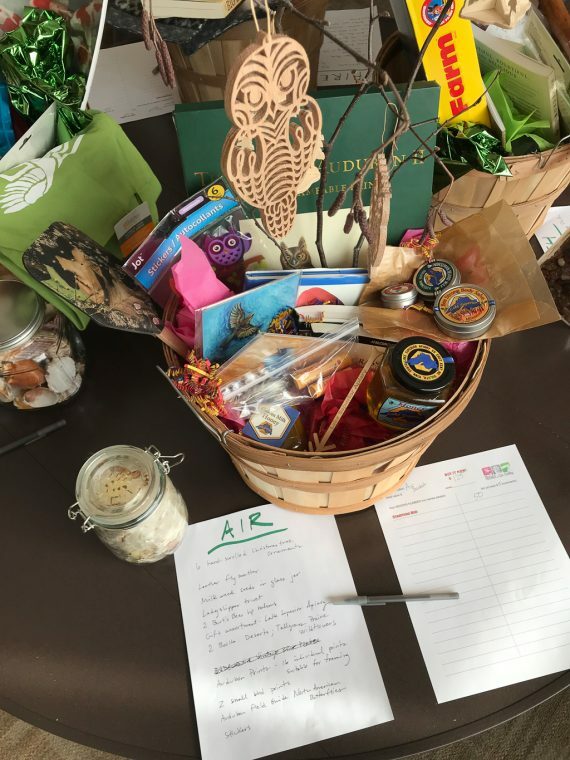 Board Chair Lori Williams made up four themed baskets for the silent auction: Air, Fire, Water and Earth. 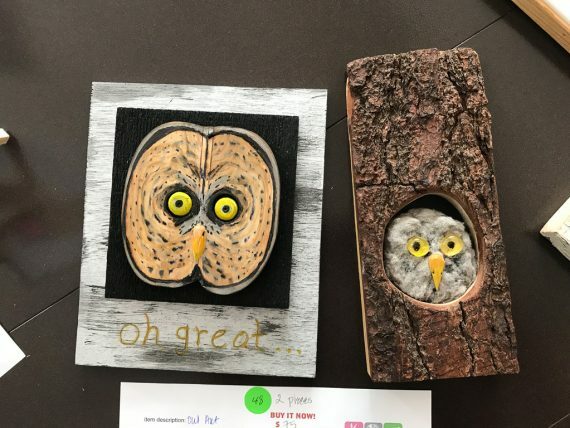 The father and daughter team of Andrew and Anna Webster made some really unique art pieces for the silent auction. 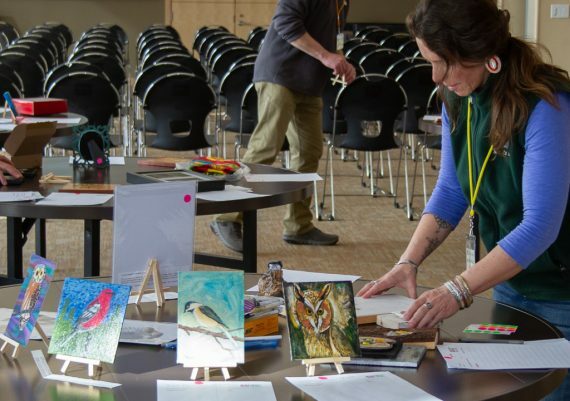 Welcome Center Naturalist/Host Heather-Marie puts out tiny bird art for the auction. 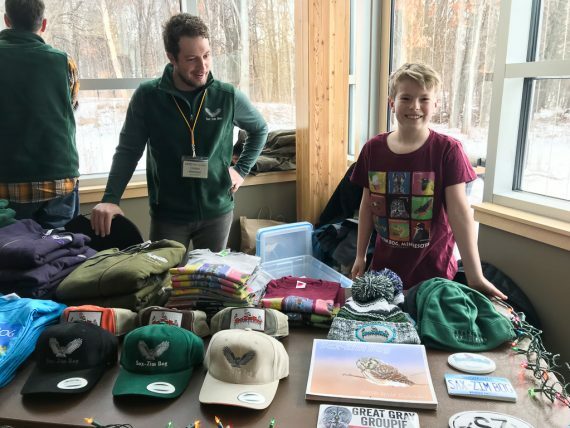 Head Naturalist Clinton and helper Brady man the merchandise table. 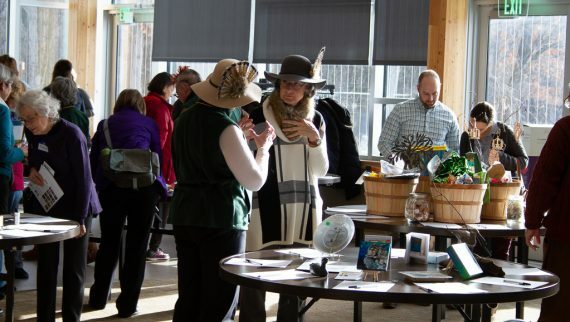 Volunteers John, Carol-Ann and Tom put out silent auction items. 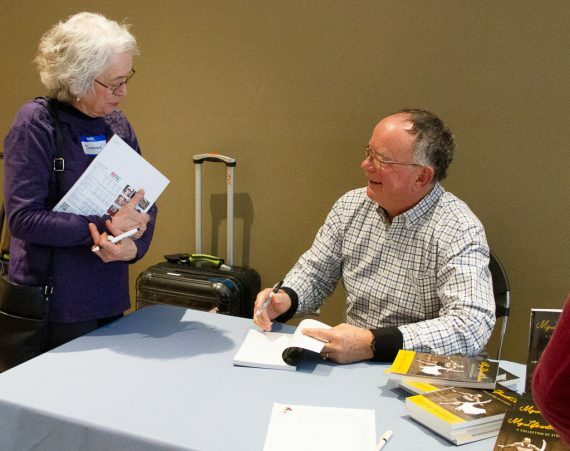 George Archibald signs copies of his book after his talk. 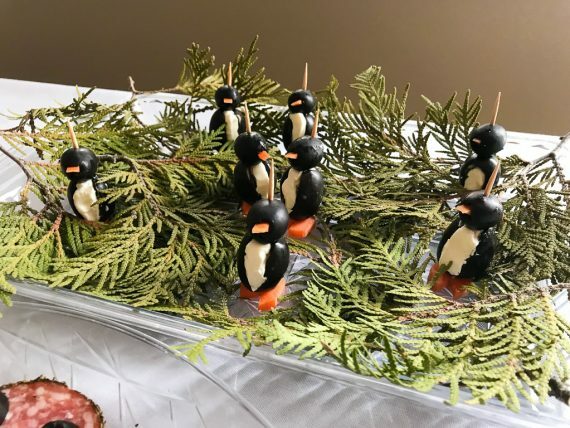 All kinds of fun bird-themed appetizers were on the spread. George talked about Sandhill Crane natural history including the fact that they actually paint their feathers with mud to stain them reddish for camouflage. 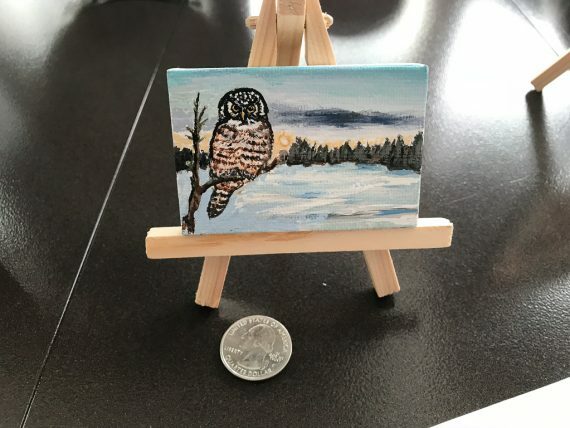 Some tiny bird art was REALLY TINY! Northern Hawk Owl by Jen Veith. Amazing wood marquetry by Jeffrey Saffele. 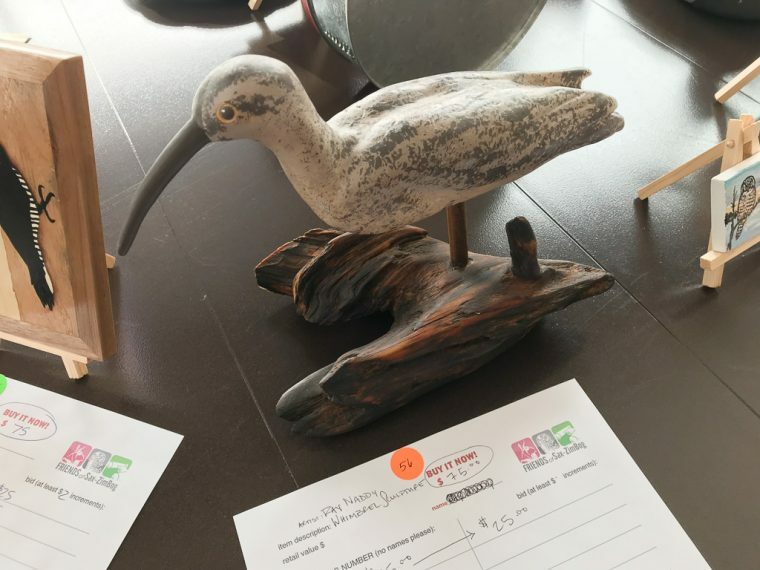 90-year old Ray Naddy’s ceramic birds were available for the auction. 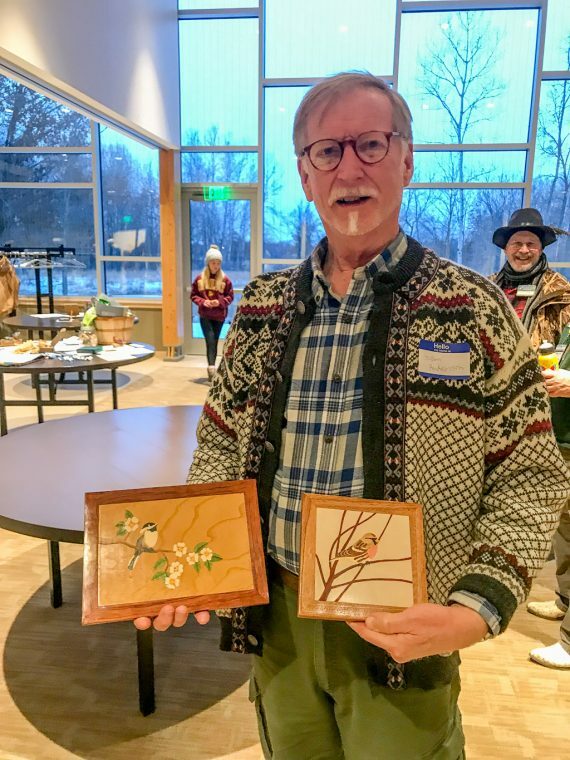 Member/donor Gordon Andersson bought two of Jeffrey Saffele’s wood marquetry pieces. 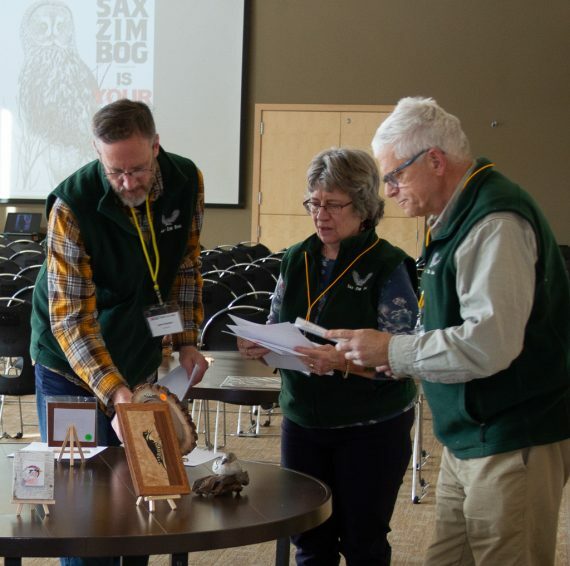 « Minnesota Master Naturalist Class in the Sax-Zim Bog!